Early October may seem too early to be thinking of Christmas gifts, but Kathy Peper, who has organized local giving trees for the past five years, would be behind schedule if she wasn't already hard at work on the project. The gifts that are donated go to foster children in Washington County, and almost every year a new facility has jumped on board and joined the program, for a total of five this year. Peper lives in Summerfield, and she started the program there with a giving tree in the Clubhouse lobby. Later the King City Civic Association, the Tigard/King City HomeStreet Bank and King City Senior Village (formerly Pacific Pointe Retirement Inn) jumped on board, and this year Bonaventure of Tigard is joining the group. "It is amazing how many gifts we get," Peper said. Tags hung on the trees include information on whether the recipient is a boy or girl and their age along with the gift request, and everyone is invited to participate in this heart-warming program. The SCOTTY Foundation works closely with the Department of Human Services that runs the state's foster-care programs and organizes the collection of Christmas gifts. At any given time, there are 600 to 800 children in the Washington County foster program, and extra gifts go to the Foster Closet to be given to children coming into the system throughout the year. 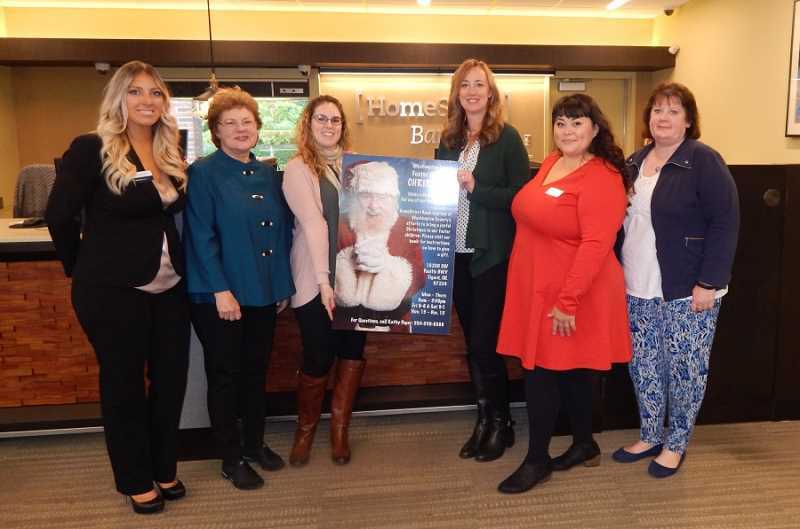 This year the sixth giving tree program kicks off Nov. 15, and recently representatives of all the local facilities got together at HomeStreet Bank to discuss the details, including Cari Lindsey, Summerfield Civic Association administrator; Lana Buckles, executive director of Bonaventure of Tigard; Haley Richardson, branch manager of HomeStreet Bank; King City Senior Village representative Maiya Martin Burbank; King City Civic Association administrative assistant Julie Chappelle; and Peper. "I think people enjoy choosing gifts for kids," Peper said. "One year someone donated an electric guitar, saying it was worth $500 and could be given as a gift or traded in for several cheaper ones, although we suggest keeping gifts under $50." Peper said the first year she did the giving tree program at Summerfield, she brought all the gifts she had picked up over the month back to the tree for a photo shoot and then took them back home, where they were picked up by the SCOTTY Foundation. "Then I figured it out and didn't do that again," she laughed. "Now the SCOTTY Foundation picks them up at the giving tree locations after we take photos." According to Peper, she ordered 375 tags to start, and she can always get more. Gift-givers choose a tag off a tree and return the unwrapped gift under the tree along with the tag no later than Dec. 15; gifts are picked up daily. "If you would like to participate but prefer not to select a tag, pajamas, shoes and underwear are always needed in all sizes," Peper said. "And neighbors or friends can go in together on larger gifts. "And gift certificates for older children are always appreciated," she added. "Please leave them with office staff." HomeStreet Bank, 16200 S.W. Pacific Highway, Building Z-3; hours are 9 a.m. to 5 p.m. Monday through Thursday and open to 6 p.m. Friday, Saturday hours are 9 a.m. to 1 p.m.
King City Senior Village is located at 11777 S.W. Queen Elizabeth; office hours are 9 a.m. to 5 p.m.; and Bonaventure of Tigard is located at 15000 S.W. Hall Blvd. ; office hours are 9 a.m. to 5 p.m.
For more information, call Peper at 503-530-8888.